Without doubt, there can be millions of reasons as to why you would want to record an audio. Maybe you want to hear your own sweet voice, or record an important lecture or record your friend’s voice at a karaoke party. Whatever the reasons might be, having a fully functional voice recorder app installed on your Android phone should be a top priority as it always comes in handy. There’s no doubt that most of the smartphones released so far offers a pretty decent voice recorder app, but trust me when I tell you that most of the needed features are limited. Hence to enjoy a rich and vibrant sound, you will need an advanced third-party audio recorder app for your daily routines. 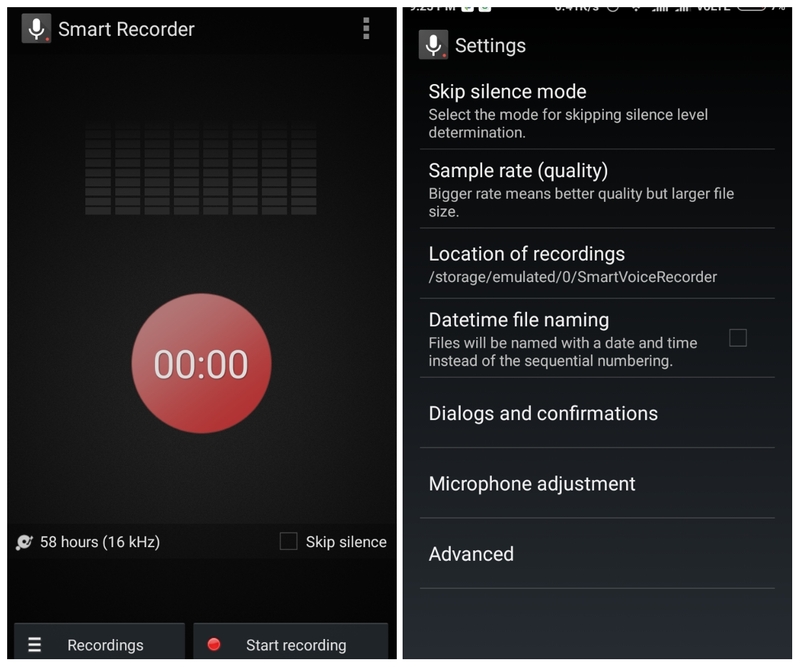 So in this article, we present to you the 5 best voice recorder apps for Android. Audio recorder is one of the best voice recorder app generally found on Sony phones. 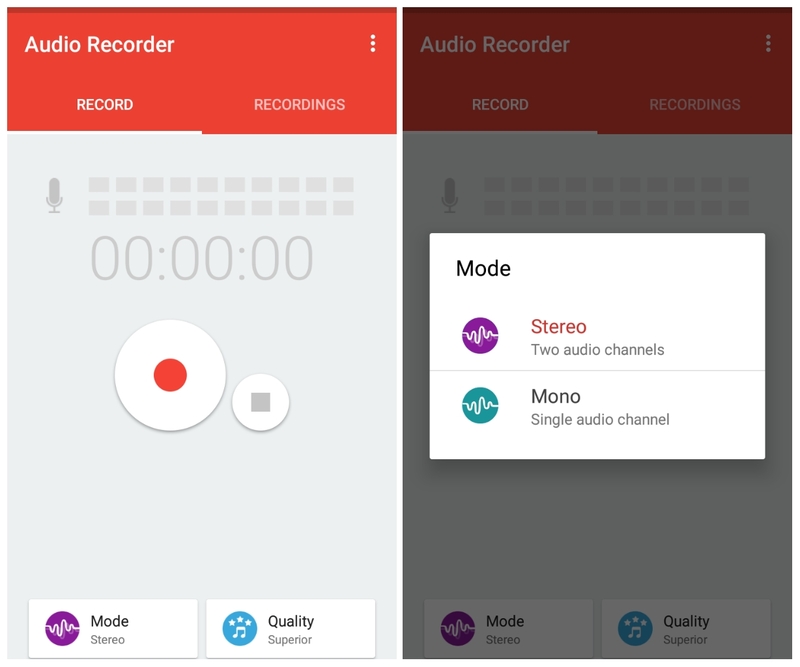 It is a simple easy to use app designed for recording voices, and it delivers all the basic features a user wants from a Voice Recorder app. Audio recorder supports many actual microphones that helps in recording some pretty decent audio. You can record stuffs, save and upload it later. It is free to download and contains some in app purchases. But trust me, they’re not intrusive. Easy Voice Recorder as the name suggests is another easy to use voice recording app. The app’s functionality and interface is pretty simple, all you need to do is to hit the microphone button to start recording, then hit it again to stop and save the recorded voice. Easy Voice Recorder gives you the ability to record audio in any particular type you want. There is also no limit to the size of audio this app can record and it also comes with widget support. If you are willing to spend for the PRO version, then you will get stereo recording, buetooth microphone and many more awesome features. Smart voice recorder is another simple yet very useful voice recording app for Android. It is literally made for long form recording, like recording lectures, speeches, etc. It has a silence removal on-the-fly option, which basically means that it can auto skip long moments of silence during the recording. The size or length of the audio files depends upon the storage available in your phone but you don’t need to worry as it makes the audio files shorter and smaller, thereby saving a lot of memory. Despite it being free, smart voice recorder constant display of advertisements can be annoying. But you can get rid of them by purchasing the Property version for a small fee. 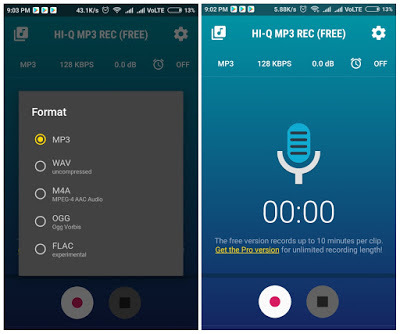 Hi-Q MP3 Voice Recorder is one of the most powerful apps in the market. 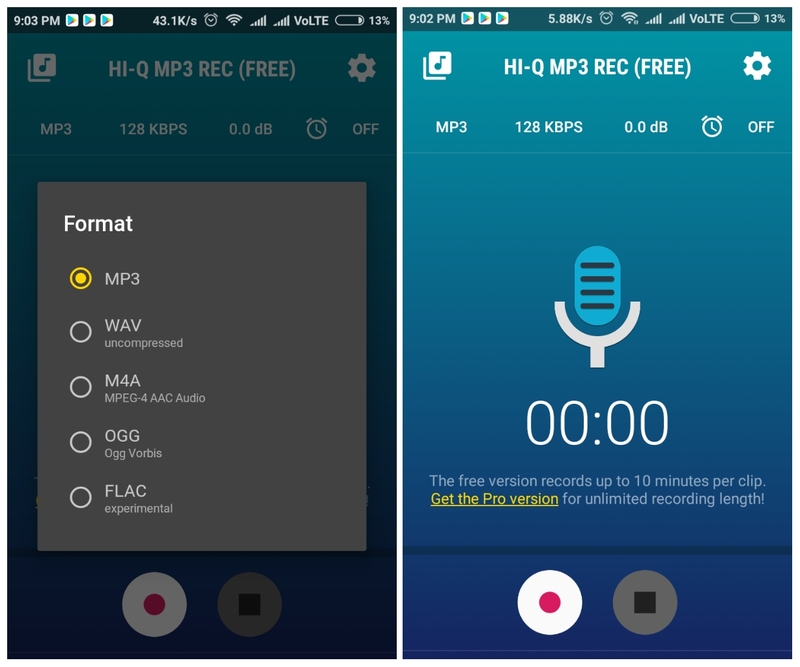 The app which records in MP3 comes with a host of features. You can make the app automatically upload the recording to Dropbox and Google Drive. There is also an option to select the microphone used for recording and to specify the input sound gain. The only downside is that the free version lets you record only 10 minutes of audio which in my own perspective is completely a turn off. But you can give it a shot and see if it delights you. Rec forge ll is an app meant for professionals, since it brings amazing features such as tempo control. gain control, pitch control and many more. Rec Forge II also has the skip silence feature and the paid version can be great for recording large audios. For all the formats except wav, the free version lets you record for only 3 minutes, but if you are into music and stuff , with a little investment you could get a great product and that’s what I’ll suggest. The list is not ranked in any way because each and every app is unique and has its own qualities. If you are into music and professional recording and editing, then go for Rec Forge II, if you want to record long audios, Smart Voice Recorder will do the work for you similarly each and every app has its own merit. 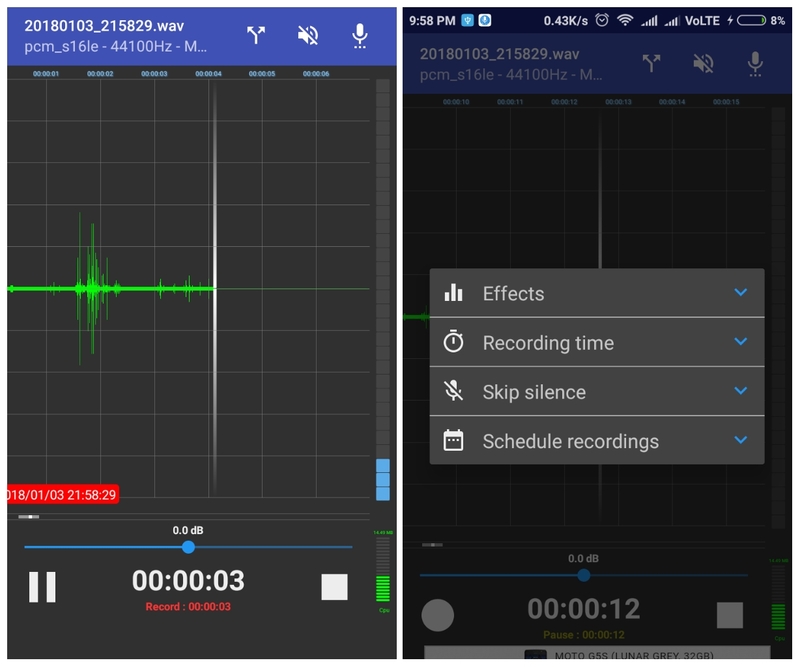 So if you like our list don’t forget to share it with your friends and family and tell them about these 5 best Voice Recorder Apps for android.